Vacation rental house. Sleeps 9, 2 bedrooms, 3 bathrooms. No pets allowed. 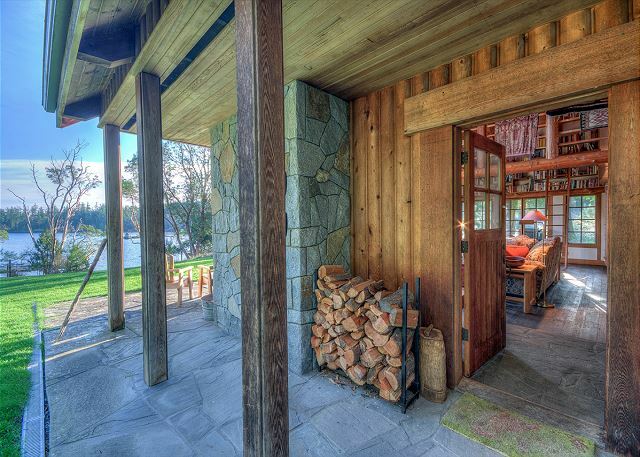 Welcome to the Lodge at Westsound! 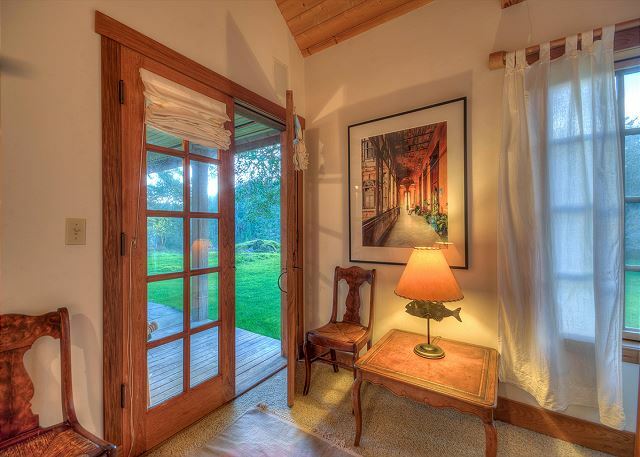 Custom woodwork is present through out this home and evident the second you step through the main entry way. The home is surrounded with beautiful lawn. A wonderful outdoor sitting area is located right in front of the home. Bring a cup of coffee in the morning and take it all in. This is island life. A view of the home from the top of the medium bank water's edge. A private dock to walk down to and enjoy a close up view of the water. From the dock you can see an expanded view of West Sound. An elevated view of the bay from the property. 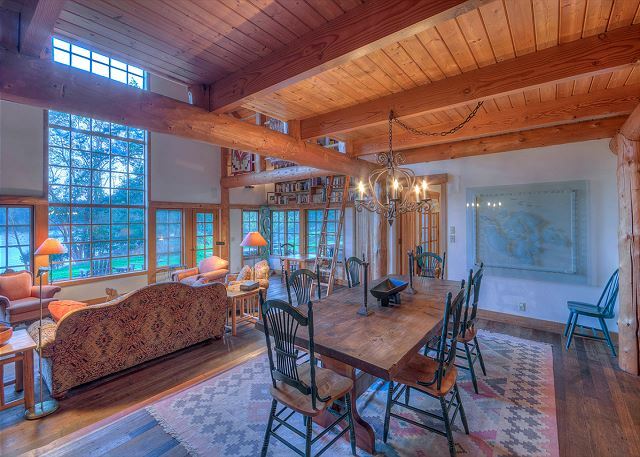 Welcome inside to a beautiful living room with exposed log work and cathedral ceilings. 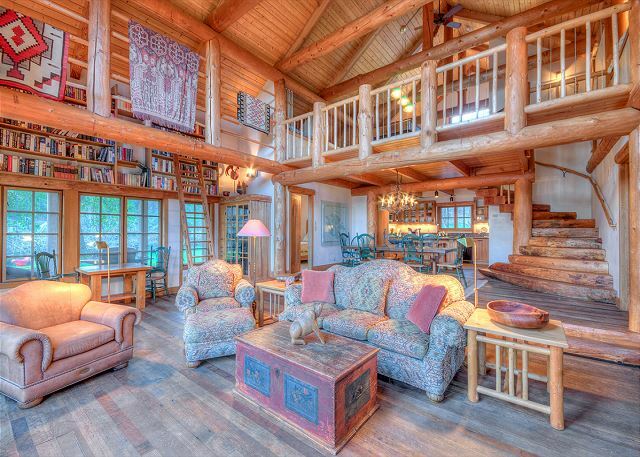 A second view of the living room looking toward the loft, log stair case and kitchen. A close up view of the wood burning fireplace. Can you imagine a cool evening sitting here, warmed by the flames? The dining room table is a step up from the sitting room off the kitchen. A view of the spiral log stair case, dining room and kitchen in the background. Like the rest of the house the kitchen is tastefully designed and spacious with a large island and bar stools for three. From the kitchen looking through the house towards the water. Head up the stairs and you'll arrive at the loft. 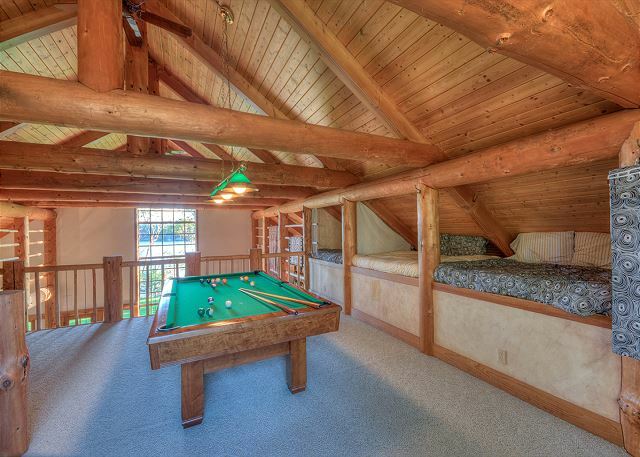 There you will find a pool table and queen size beds tucked to the side - great for kids OR adults! A second view of the loft, pool table and bathroom. Looking down on the living room from the loft. A second view of the living room from the loft. 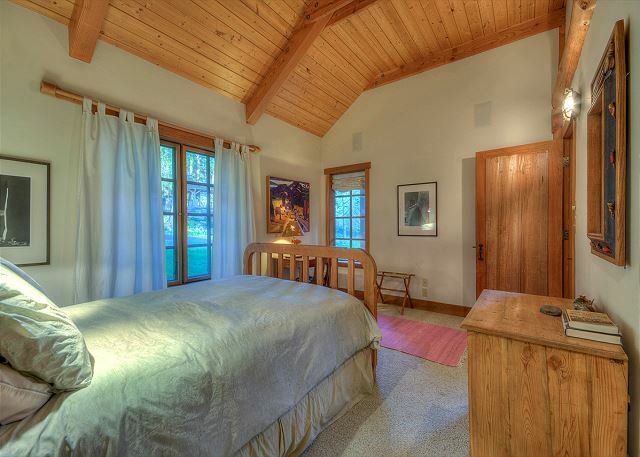 The well appointed master bedroom is located on the main level and has its own doors out to the patio sitting area. Another view of the door outside from the master. 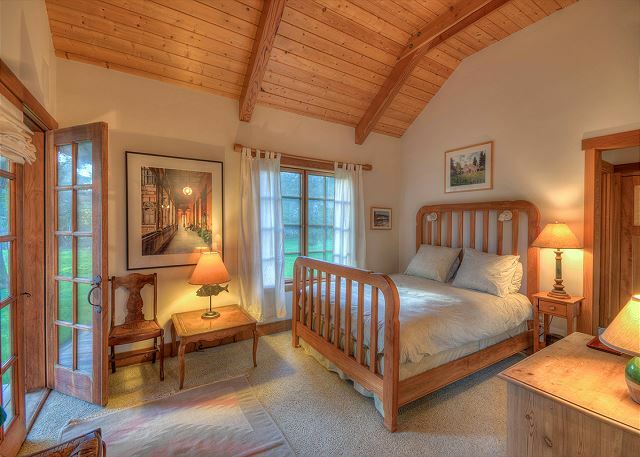 Looks like comfort - think you could relax here? The second bedroom is also incredibly comfortable with a queen size bed and writing desk. We hope you choose to stay with us at the Lodge at Westsound. Can you imagine an evening stroll around this property? Constructed in the style of a ski lodge, guests will be surprised to see a view of the bay from this home rather than mountain slopes. Sitting slightly up from the water on an estate outside of Deer Harbor, The Lodge boasts extensive lawns leading guests down to the shore and pocket beach. 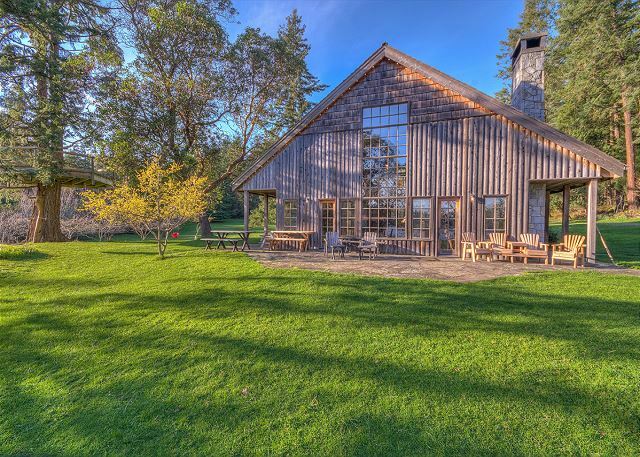 With great southern exposure, this property allows guests to soak up the sun all day long. 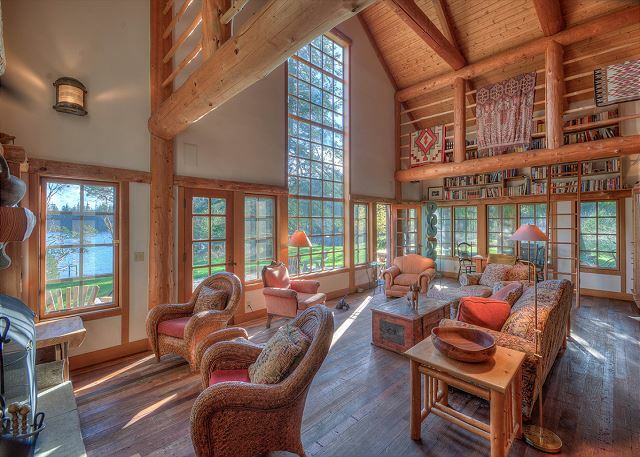 The living area of this home is expansive thanks to its high,vaulted ceiling and lofty windows. While radiant floor heating is the main source of warmth, a large stone fireplace adds an extra layer of comfort. The kitchen is open and well-lit with polished granite counter tops, a center island, and bar stool seating. A small mud room off the side of the kitchen houses a washer and dryer, and a back door that leads out into the garden. There are two bedrooms on the main floor, located on opposite sides of the house. Each contain queen sized beds, and the westerly room has a set of French doors leading outside onto the patio. Both rooms also boast their own bathroom with deep clawfoot bathtub and curtain shower enclosure. A majestic lodge stairway leads to the upstairs loft where guests have access to their own pool table. In this recreation area is where the television can be found, with satellite connection and DVD player. The sleeping loft contains several nooks fitted with queen sized mattresses. A third bathroom is also located at the top of the stairs, with shower and large vanity. Outside, a large stone patio wraps around the south side of the house, providing the perfect spot to kick back in one of the patio chairs. A propane BBQ is provided for guests to enjoy the outdoor grilling experience. 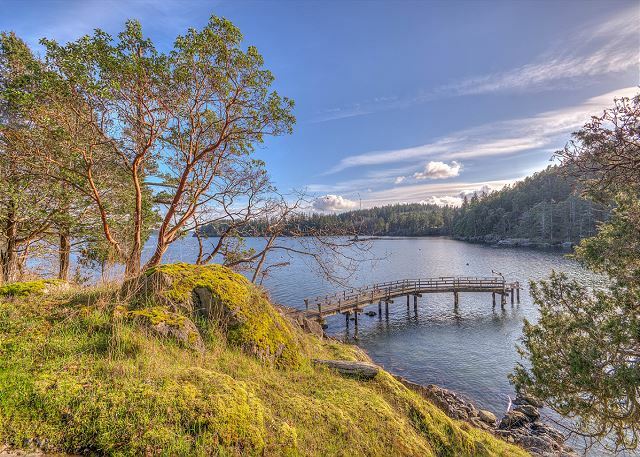 This home is perfect for families with kids and is close to all the amenities of Deer Harbor, such as kayaking, whale watching, and horseback riding. You drive down a private driveway and as your approach the water, the privacy of the cove and location of the Lodge immediately makes you smile, relax, feel fortunate. The Lodge has its own gorgeous vegetable and flower garden and its hard not to peek through the gate even before you enter the house. You are now in some fabulous movie, a world so special that usually you only see it on a screen. Pepper Schwartz, Ph.D Professor, University of Washington author: Frommers: Places for Passion: the 75 Most Romantic Destinations in the World. We had our family vacation here at the lodge this September. We loved the location being close to town, but it felt remote. The home is wonderful, it has so much character. We all loved going thru the collection of books. The garden was a great delight as we made salads fresh to our table. It added to the beauty of the experience. Over the top Orcas stay! It was perfect for us! Great house, beautiful spot, glorious garden to savor, everything well taken care of! Thank you!!!! Thank you for your review of this gorgeous home. We are so glad you enjoyed your stay! We hope to welcome you again to a vacation home managed by NW Island Escapes. Our family had a great stay here. We loved picked fresh herbs and veggies from the garden. Fireplace was great and being able to sit out on the dock was memorable. House had lots of games for the kids. The stereo system with speakers throughout the house was nice. Overall great house. 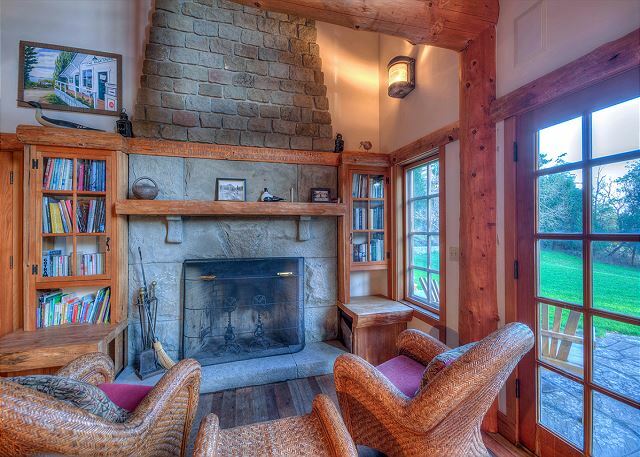 The Lodge at Westsound provided a marvelous setting for a hubby/wife getaway to Orcas. 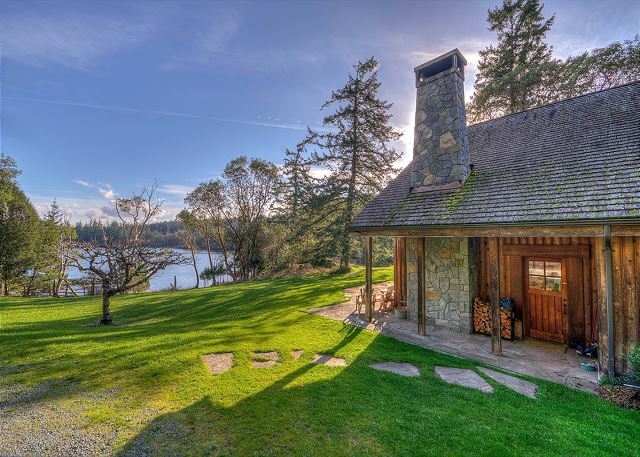 The cabin is very charming, well appointed, and situated on a beautiful slice of land overlooking the water. There are neighbors nearby, but privacy is aplenty. 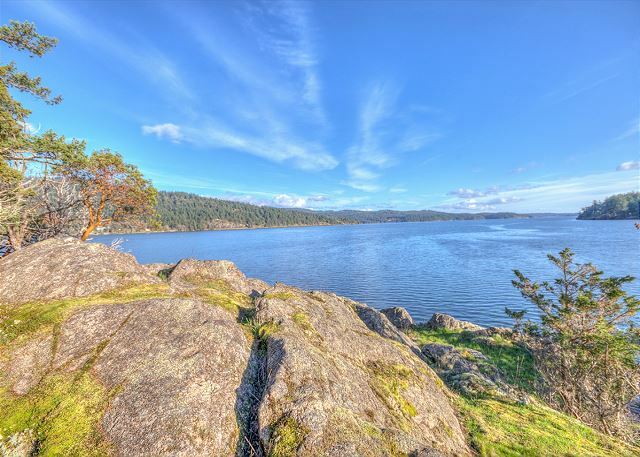 Hike Turtleback Mountain or enjoy a pizza and a pint in Deer Harbor, both just around the corner - great location. Great place for a special gathering. The kitchen was well equipped and fun to gather and cook. The house was prefect for our family gathering. 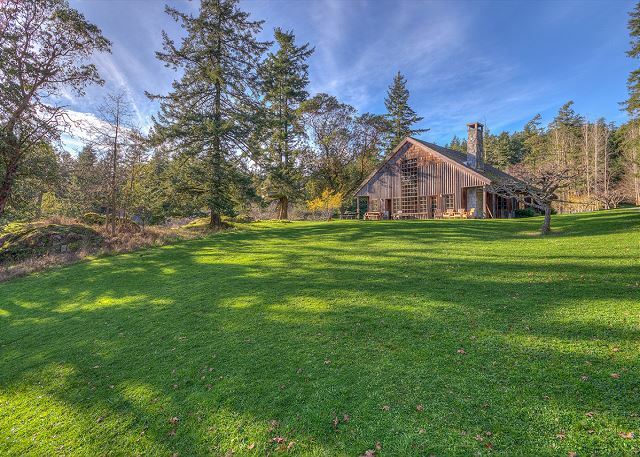 I would highly recommend this home to those looking for a relaxing location and a fun place to play indoors or outdoor—to experience the beauty of Orcas Island. We all want to return. Beautiful location, easy ride to the ferry to see other islands as well, via bike. Beautiful property, very comfortable and spacious, with lovely rustic charm and history, on a magical island. We had a delightful time in "The Lodge," and would happily return. Our only two material suggestions: the front door lock is tricky and sticky; I think it is too easy to accidentally lock oneself out, and I believe the lock is too complicated for the house's good. Also, I think the kitchen could be a bit better stocked with plates, glasses and crockery. Otherwise, wonderful. The Island was wonderful with so much to do, hike, kayak, swim, paddle board and play games in the yard. We had a great time and the house was perfect for our families to spread out and enjoy each others company. Jillian S from Richmond, British Columbia does not recommend this vacation rental. We loved the lodge, and the location and property were perfect. There were 2 problems; first, despite being reassured by the rental company that the rodent issue I read about in other reviews had been addressed it most certainly has not been solved!!! There were droppings all over the house, especially behind the beds, in kitchen drawers and cupboards and most unfortunately in the kids play toys. This is a health and safety concern. Also, there were live nouse traps in the storage area and one actually had a mouse trapped in it--this should have been cleaned before we arrived. The second concern is that the kitchen does not have enough dishes, glasses and cutlery for the number of people allowed in the rental. There are also only tiny luncheon plates, no dinner plates--and no serving/table wear to put food on. The kitchen did have a good selection of bakeware etc which made big family meals much easier. We loved the design of the house and other than the rodent feces we found it to be clean and well stocked. The cabin was adorable and very clean. We really enjoyed watching the birds and our kids enjoyed playing in the large lawn. We all had a blast. Thank you to the owners for such a great experience! Ideal, just as advertised. 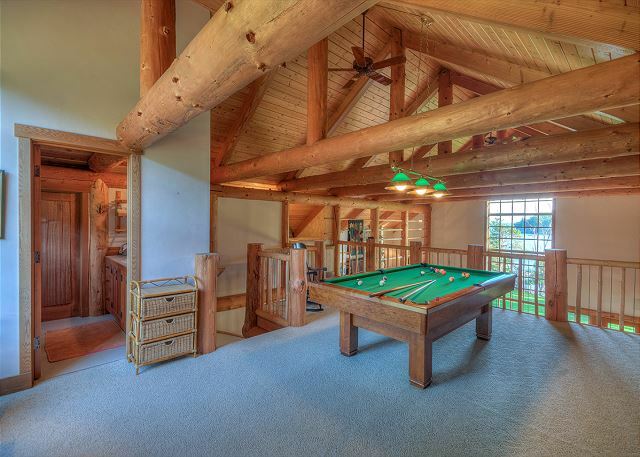 Especially enjoyed the large loft area with top of the line pool table. We had a wonderful time at the Lodge at Westsound. 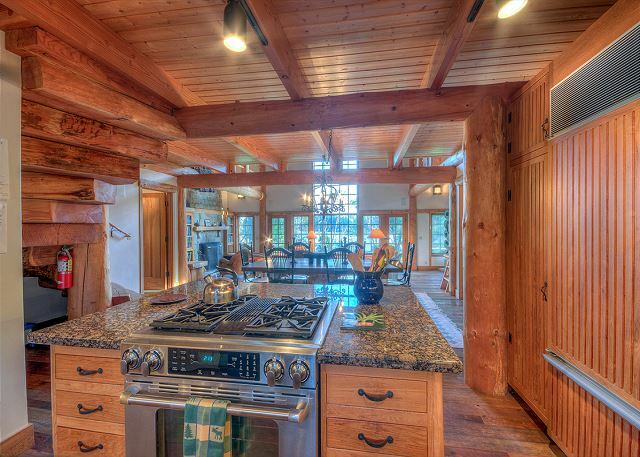 This is a gorgeous property and the lodge was just perfect for our extended family. It was a rainy weekend and the fire in the large stone fire place was very welcome. We never got to meet the owners but were very impressed that they delivered board games to us on this rainy weekend through the pleasant and very responsive rental agency. Thank you! We brought our kayaks and went kayaking right from the front yard. Turtleback mountain preserve is just 2 miles away and many of us went for runs and walks there, highly recommended. We had absolutely no trouble with mice as one review mentions. We saw no sign of them inside. Everything was clean and beautiful. As a wildlife ecologist I loved bird watching (the fruiting madrone trees brought lots of birds in), walking the shoreline, and seeing those little surprises like the native Oaks and cacti growing wild. The backyard garden was well taken care of and lovely. Absolutely wonderful place and people and plenty to do even in the rain. We'd love to return in the summer sometime! What a wonderful time we had over the 4th of July holiday! The property is beautiful, view is breathtaking, the home felt just like HOME, and the fantastic backyard garden was an added bonus. Fresh picked greens in the frig welcomed our arrival and we enjoyed selecting random veggies, etc to add to meals we had planned. The kitchen was very well equipped and all of the home's furnishings were very comfortable. We were a family coming together from all over the country and this home provided the best backdrop and accommodations to do that in. There were some several quality toys and even a mini kitchen for our little one to play with, there was only one family game that we found (but we brought some of our own), 2 pak n plays and a booster dining seat which is great to know if you are traveling with little ones. (Just as an FYI...The ones that slept in the loft beds, did have to get up with the first people and go to bed with the last as the sound really traveled up to them.) Took a kayak tour with Shearwater out of Deer Harbour and a whale watching with Orcas eclipse Charters by the ferry landing. I highly recommend both and both were convenient from this property. Also did Orcas pottery and Mt Constitution/Moran State Park...again recommend both! Winery was closed when we were there so did not get to do it. :-( Eastsound was a great town for restaurants, some shops, BROWN BEAR BAKING (yum!!! ), and Island Hoppin' brewery, but was a little further from this property than I had realized. Not enough of an issue to make me not want to stay there again, but just as an an FYI in your planning. The times we weren't exploring, in town, etc we loved just relaxing in the home, or outside in the beautiful surroundings on this property, with a book, coffee, or family conversation and games. Owners live on the property and were wonderful!